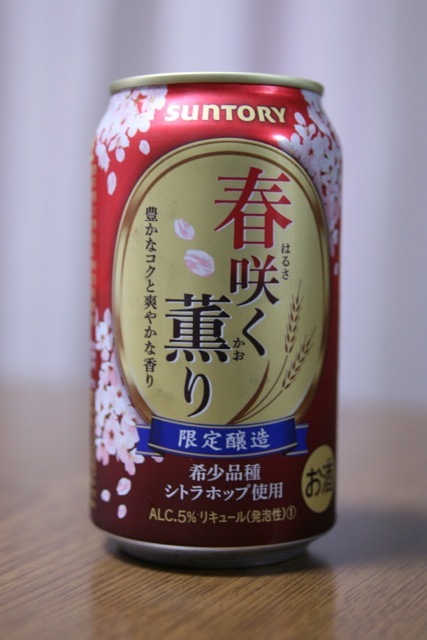 Coming into cherry blossom season here in Japan, Suntory is one of the only major brewers to release a limited spring “new genre” brew. Suntory Harusaku Kaori, utilizes North American malt and citra hops in a late hopping process to infuse lots of fragrance into the brew. Cherry blossoms on a crimson background make the packaging easy to spot on store shelves. Let’s see if you should add this to your grocery list for spring. Popping the top of the can you’ll immediately notice the fragrant fruity aroma from the hops. The aroma itself reminds me somewhat of the IPA microbrews from back home. Harusaku Kaori has a burnt orange color to it, deeper than the standard lagers but not going into the “amber” territory. Before you take your first gulp just sit back and enjoy the aroma, it’s a rarity from the macro brewers. Lots of citrus-like fruit up front along with some acidity, the aroma really transitions from the nose to the tongue well. On the mid-palate the bitterness comes across turning to a hint of sweetness, then back to bitter down the throat. The finish is quite clean and sharp leaving hints of bitterness and citrus in the mouth. Suntory Harusaku Kaori brings a very refreshing fragrant new genre brew to an often too standard boring macro brew scene. 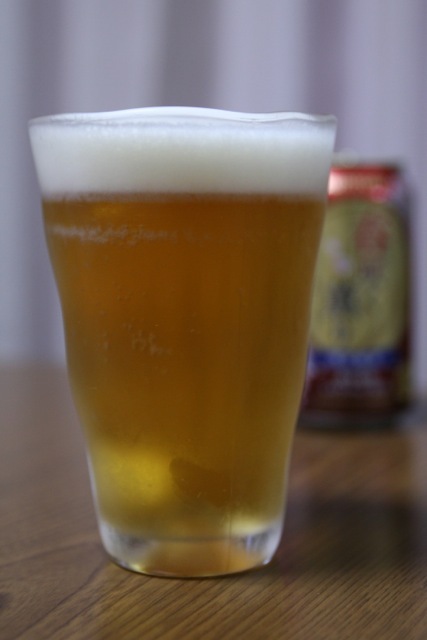 Its crisp medium body combined with its depth of flavor is a welcome relief to this beer drinker. If you can still find Harusaku Kaori on the store shelves, you might want to stock up for cherry blossom season. This entry was posted in Liqueur (Happousei) and tagged dai-san, happousei, Limited Production, new genre, seasonal, spring, Suntory. Bookmark the permalink.